Dairy allergic people, vegans and raw foodies don’t eat dairy based cheese. But, if you have any of these dietary requirements, here is a delicious alternative you can make at home based upon raw cashews. It is a spreadable cheese, tasting like a cheesy dip. 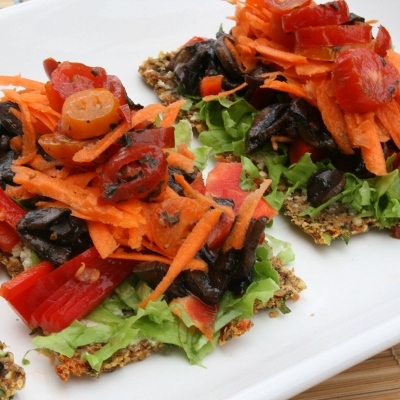 I have used it here in the raw nut free bread topped with shredded vegies and mushrooms marinated in tamari and marinated heritage tomatoes. It’s quick, easy and really delicious. 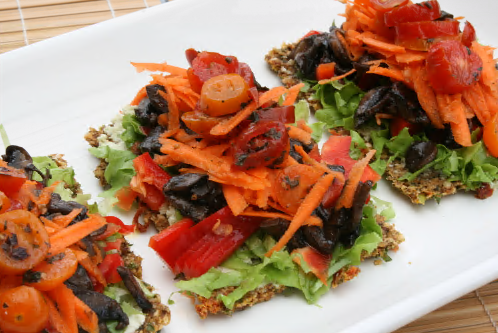 In case you are wondering, the yeast flakes are not the yeast you use in bread, but savoury yeast flakes that add a cheesy flavour to all dishes. We love them. Buy a pack at the health food or organic shops. 1 tablespoon finely chopped herbs of your choice. Sage is good to use with mushrooms, parsley or oregano good all rounders. Process all ingredients except the herbs in a food processor until fluffy. This soft cheese keeps in the fridge for a week and is also delicious with biscuits and as a dip. Rolling small balls of this cheese into sesame seeds, poppy seeds or herbs gives you a decorative and flavourful addition to the plain cheese.